A Weighted Vest Can Help!! So exactly how does a weighted vest therapy program work? The main idea of using weighted or deep pressure input revolves around our proprioceptive system. This is the system that our bodies use to determine our sense of position relative to the space around us. Basically, this means where we are in reference to the world around us. An autistic child who has difficulty calming themselves may be looking for a way to calm their overactive nervous system. 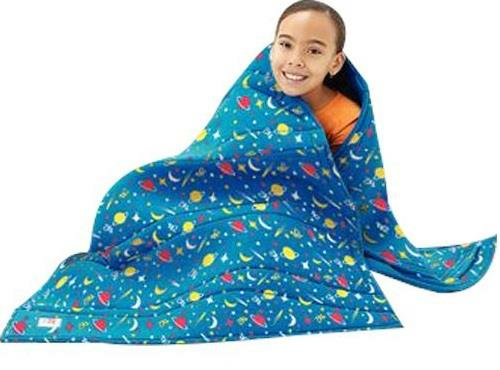 It’s this weighted sensation that can provide the appropriate proprioceptive input to calm and relieve any anxiety that the child may be experiencing. Typically, a weighted vest should be approximately 10% of the user’s body weight and can increase on-task behavior anywhere from 18% to 25%. It’s important to note that a weighted vest may not work for everyone and may even be used in conjunction with some other type of therapy strategy. As a calming tool, these vests can be incorporated in a classroom environment as an intervention that does not disrupt other children. There are many techniques to achieve success during this type of therapy. 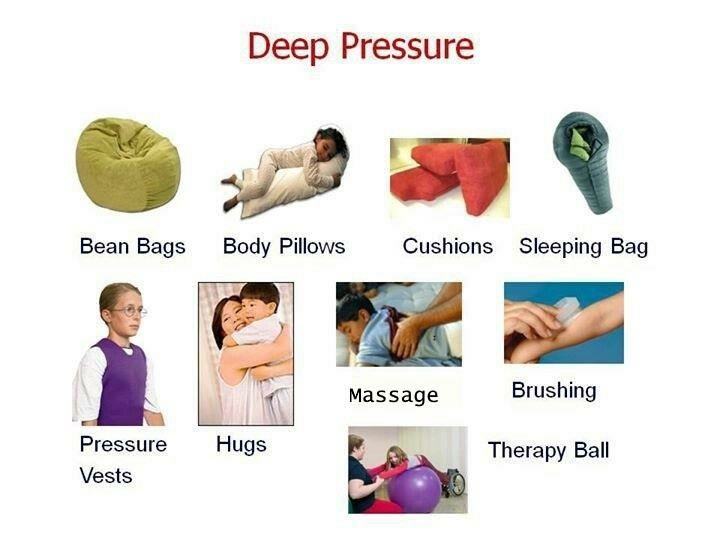 Whether it’s active therapy that includes hugging or using beanbags or exercise balls to gently apply pressure, the benefits can be dramatic. When weighted therapy is applied, the body can release the hormone dopamine which helps calm the nervous system. 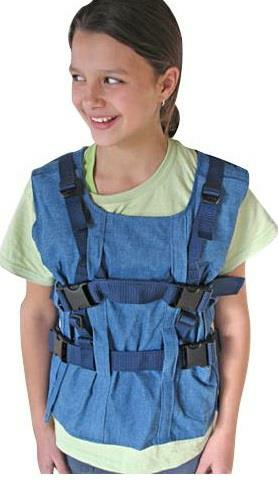 Children who suffer from SID or ADHD can benefit from a weighted vest in order to calm them. 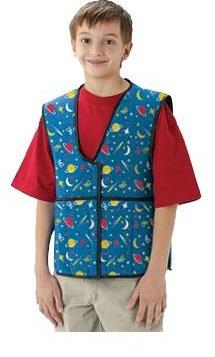 These vests are worn for approximately one hour at a time and then removed. You can reapply the vest at regular intervals or when needed. Extended usage is discouraged since this allows the body to become accustomed to the proprioceptive input, therefore negating the benefits of this weighted therapy. Since children come in all sizes, Tumble Forms offers weighted vests that are available in different sizes and as your child gets older (and larger) offers additional pockets so you can add weights to it. 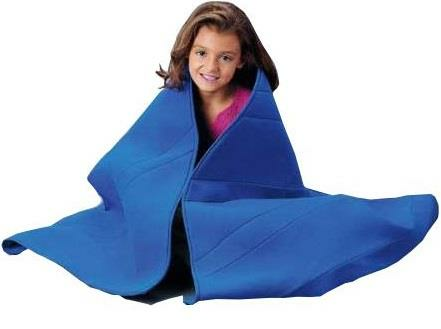 This allows you to customize your child’s weighted therapy as well as making their favorite vest available to them as they grow. 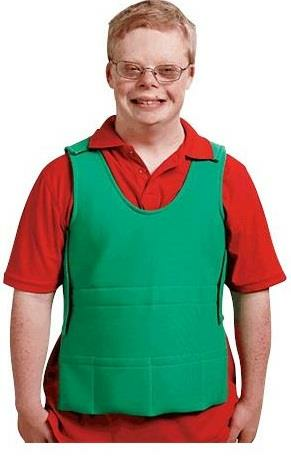 From an extra small vest with four pockets to an extra-large vest with eight pockets, these easily secured vests can be adapted to just about any size child. Each vest comes with four ½ pound weights, four 1 pound weights, and four 2 pound weights. These weights are made of lead-free steel shot evenly distributed in a nylon sewn casting. Adjusting your vest to your child is simple since they incorporate Velcro fasteners so you can make the vest as snug as necessary. Additional weights for weightedvests are available in the same ½ lb., 1 lb., and 2 lb. options. 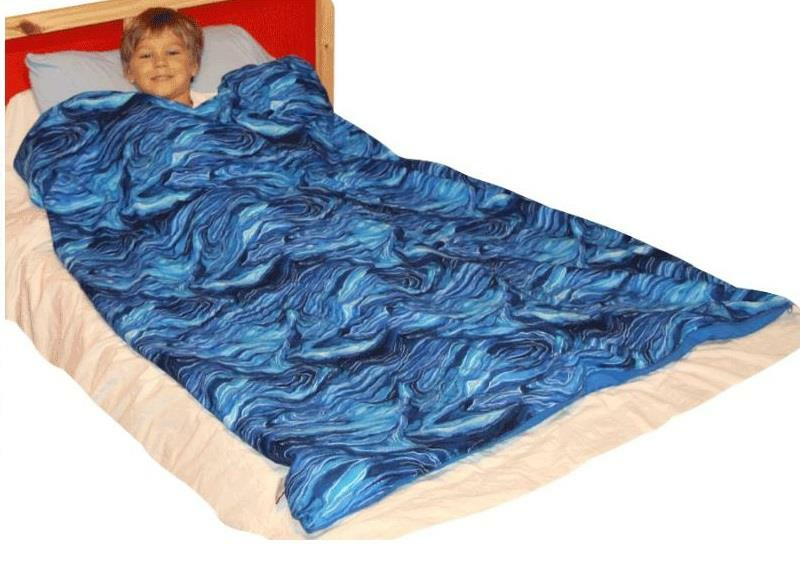 This allows parents to add weight if necessary in order to calm autistic children with the proper deep pressure input necessary. You can work with your child’s therapist to dial in the proper added weight necessary to overcome their trigger. If the weighted vest works well for your child you can explore the possibility of a weighted kit. This includes a weighted vest, gel lap pad, a weighted animal, and a shawl for a change of pace and keeping your child’s interest. Proprioceptive input can benefit children on the autism spectrum by calming their nervous system and allowing them to concentrate on tasks at hand. This calming can help with social events, homework, or even just enjoying family time. You should work with your child’s therapist to achieve the best therapy program for your child at therapy and in a home environment. Many therapy techniques, such as a weighted vest, can be used out in public to avoid or minimize embarrassing episodes.